Since I’m always reading something, I thought I’d include a book review here and there in my blog. 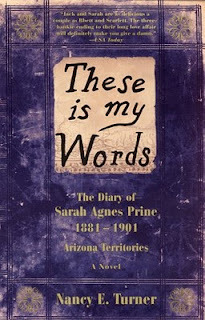 Last month, my book club chose These is my Words: The Diary of Sarah Agnes Prine, 1881-1901 by Nancy Turner. It is set in the southwestern territories (a.k.a. Texas, New Mexico, and Arizona) during a time when the land was constantly battled over by Indians and pioneers. The book is based on the author’s family background. It is written entirely in diary-entry format, with Sarah’s grammar growing more sophisticated as time passes. This book has become my new favorite book club pick (before it was Hannah Coulter by Wendell Berry). The reality of the west during the late 1800s and early 1900s was really emphasized. Death and death of children was a common occurrence. Childbirth was difficult and natural. And being a woman required an inner strength. Sarah is, in many ways, like Camilla (from my book). She’s strong, she’s independent, she’s capable. She can shoot a gun like no other man (and proves it time and time again). She takes care of her family when her mother is not in her right mind. But she’s naïve when it comes to affairs of the heart, which makes her story so hilarious and so tragic at the same time. For those of you who love historical fiction like me, you’ll enjoy this book.